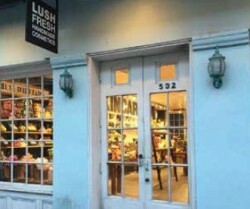 Cosmetic Deli: Lush Fresh Handmade Cosmetics opens two new boutiques in NOLA. If you’re looking for some good, clean fun, be sure to stop into one of the two new Lush stores (or both!). Once inside, you’ll find a plethora of luxurious and ethical skincare, haircare and bath goodies, as well as unique gifts — all made from fresh, high-quality ingredients like fruits and vegetables, fine essential oils and rich butters. Every single Lush product is vegetarian, and about 85 percent are vegan, 40 percent are preservative-free and 35 percent are unpackaged. What’s more, Lush supports Fair Trade, Community Trade and charitable initiatives to ensure that each product makes a positive impact on the world. 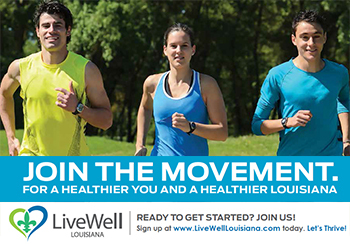 The first location to open is a 1,990-square-foot store on Magazine Street, and the second is a 1,450-square-foot boutique on Royal Street. Each is stocked with the brand’s famous bath bombs (try the Experimenter, which releases a bevy of different colors and scents) and fresh face masks (I love The Sacred Truth, made with anti-oxidant wheatgrass, green tea and enzymatic papaya). And if you have trouble deciding on what to get, Lush’s expert consultants can point you in the right direction based on desired effects. Louisiana Seafood: The American Seafood Coast Guard takes a stand for domestic seafood with a new initiative to educate consumers. If you’re like most consumers, you assume that the seafood you get in local stores and restaurants is always domestic, when, in reality, the seafood is domestic only about 10 percent of the time. As compared to imported seafood, American domestic seafood is much safer than imported varieties. According to The American Seafood Coast Guard, a significant amount of imported seafood contains harmful chemicals and is farm-raised or processed by slave labor. Know your labels. County of Origin labels are required for seafood sold in the United States. Flip the bag; learn how to properly identify the Country of Origin label. Build relationships; find a reliable, knowledgeable retailer. Ask about it; ask restaurants and establishments about the origin of the seafood served. Dryades Public Market celebrates its grand opening in the historic Myrtle Banks Building. Last month, Dryades Public Market opened it doors, offering fresh produce, grocery staples, and prepared foods and beverages in heart of Central City. The grocery store and prepared foods market anchors a major revitalization project on Central City’s main corridor. The store is open seven days per week; fully stocked grocery shelves; a full fresh produce section, featuring seasonal and local produce; refrigerated cases stocked with local meats, meats cured in-house, and local eggs and dairy; dozens of local products throughout the store; an indoor dining area and outdoor patio seating; dine-in options including Esses Foods (house-made pastas), Curious Oyster Company (raw oysters and seafood dishes) and Bar 38 (happy hour, cocktails and mocktails), as well as in-house prepared hot food dishes.